Dichromated Gelatin is the most versatile material presently available for recording reflection holograms for image display. Aside from its well known properties of low scatter and high diffraction efficiency, its peak reconstruction wavelength and reconstruction bandwidth can be controlled independently over the entire visible spectrum. Observed relationships between reconstruction color, exposure wavelength, exposure energy, and processing parameters suggest a new model for the mechanisms of hologram formation in dichromated gelatin. The author is a consultant in optics and optical holography in Santa Clara, California. He was previously chief physicist at Holex Corporation in Norristown, Pennsylvania, and manager of research and development for Holotron Corporation in Richland, Washington. Particular areas of interest include optical data processing and applications of holographic optical elements. The characteristics desirable in display holograms are somewhat different from those desired in HOE's. Display holography has to compete with the other graphic arts. A painting, for example, is only two dimensional, but its colors can provide a perceptual solidity that easily overwhelms the thin three dimensionality of a monochromatic hologram. Dichromated gelatin is uniquely capable of providing holograms in colors that rival the rich colors available in the other graphic arts. This paper describes techniques developed by the author over the past six years for controlling the color of reflection holograms in dichromated gelatin. Sensitizing, exposure, and processing techniques are presented. A new model for the mechanisms of hologram formation in dichromated gelatin will be presented based on the empirical relationships among reconstruction qualities, exposure geometry, and processing conditions. All holograms referred to in the following discussion will be reflection type holograms. Practically all of the literature on dichromated gelatin refers to the use of Kodak 649F plates. 1,3,4 An experimenter quickly discovers, however, that the results obtained in Kodak 649F plates tend to vary greatly from batch to batch in scattering level, color, and sensitivity. After much trial and error, one can learn to vary sensitization, exposure, and processing conditions to obtain results that are reasonably consistent from batch to batch. The task of obtaining consistent results is vastly complicated by the near impossibility of finding one to one relationships between the reconstruction characteristics and conditions under control of the experimenter. Some of the conditions that can significantly affect hologram quality and reconstruction characteristics are listed below. The relationships among some of these conditions and characteristics are roughly represented in Table 1 where "+" indicates a positive correlation, "-" represents a negative correlation "A" indicates an ambivalent relation, and "0" indicates little or no significant relation. A 649F plate, or for that matter any photographic plate, can be used as a source of a uniform gelatin layer. The silver halide is removed by a fixer followed by a water wash. This is the stage at which the initial hardness is set. 649F plates vary considerably from batch to batch in hardness; and the degree of hardening during fixing depends both upon the amount of hardener included in the fixer and the amount of time spent in the fixing bath. Kodak Rapid Fix with hardener is useful here because the amount of hardener can be easily varied. Kodak Rapid Fix does not remove all of the dyes from the emulsion, so after a water wash a methanol wash and another water wash may be used to remove the remaining dyes. The plate at this point carries a layer of pure gelatin. It is now immersed in an aqueous solution of ammonium dichromate whose concentration may be anywhere from one percent to twenty percent by weight. Increasing the concentration increases the sensitivity, but it also has a strong effect on the color of the hologram. The reason for this will be discussed later. The basic sensitivity of dichromated gelatin is in the ultraviolet region, extending into the blue and green. Various dyes may be used to enhance sensitivity throughout the visible spectrum. 3,5,6 The dye remaining in 649F emulsion after fixing is compatible with ammonium dichromate. By skipping the methanol bath and thereby leaving the dye in the emulsion, green sensitivity is approximately doubled. After soaking in the ammonium dichromate bath, excess liquid must be removed from the gelatin surface. Any unevenness in drying will result in significant color variations across the hologram. Drying in the dark in warm, circulating air works well. After a hologram has been processed, it may be reprocessed. The noise level tends to increase after several reprocessings. After removal from the water bath, it is quite easy to observe differential degrees of swelling in areas that have received different levels of exposure. If the initial hardness of the gelatin is very low, it tends to swell dramatically in the sensitizing bath, or even dissolve in sensitizing baths of high concentration, while the swelling in water alone may be relatively small. Gelatin does not swell or dissolve noticeably in pure isopropanol. The solubility of gelatin in water increases as the alkalinity of the water in creases. Gelatin feels slippery in water, but feels stiff and dry in alcohol. At a fixed alkalinity, there is a threshold temperature at which the solubility of gelatin in water abruptly rises to a high level. Gelatin is composed of long helical molecules. The hardness of dichromated gelatin is known to be increased by exposure to light. Within certain temperature ranges, there is a tendency for color changes to occur in blotches with sharp boundaries whose area increases as bath temperatures increase until the color change is complete over the entire hologram. The emulsion of a developed and dried hologram visibly collapses when touched with a damp finger; when breathed on, its color rapidly sweeps toward shorter wavelengths, and the image soon disappears. It is not uncommon for a considerable amount of gelatin to accumulate in processing baths containing warm water. A pure gelatin layer on glass, dried from solution, will stabilize at a standard density. When immersed in an ammonium dichromate solution, it swells to a degree determined by its solubility in the solution. Gelatin solubility in aqueous solutions of dichromate is determined in turn by the initial hardness of the gelatin, the pH of the solution, and the temperature of the solution. The gelatin swells by absorbing water, and the water carries dissolved dichromate into the gelatin. The water to dichromate ratio is nearly equal inside and outside the gelatin, so the amount of dichromate within the gelatin layer is dependent both on the concentration of the solution and the amount of swelling of the gelatin. When the sensitized layer is dried, the dichromate remains in the gelatin while the gelatin shrinks. The dichromate concentration in the dried layer can get quite high: up to 25% by weight. The volume of the incorporated dichromate adds significantly to the thickness of the gelatin layer and consequently strongly affects the ultimate color of the hologram. During exposure, the gelatin is locally hardened by photochemical reduction of dichromate to trivalent chromium resulting in gelatin crosslinking. 3 Gelatin is in the form of a "felt" of helical molecules, and crosslinking will occur both between molecules and between segments within individual molecules. In the water wash following exposure, the dichromate is dissolved out. The gelatin swells again. The degree to which it swells is largely controlled by the average hardness: the initial hardness plus any added hardness due to dark reaction, hardening in the washing process, and the average level of exposure. Swelling is also controlled by pH and temperature. The degree of swelling will vary locally according to the AC modulation of hardness due to exposure. Depending on pH, temperature, and hardness, some gelatin will be dissolved at all stages of processing, primarily at the surface and internally in a pattern corresponding to exposure. Following the water wash, the plate is immersed in a series of baths at various temperatures with various ratios of water to isopropanol. If the ratios and temperatures are varied gradually, and if the plate is left in each bath long enough to reach equilibrium, the degree of swelling will change gradually in response to the varying bath conditions. The emulsion thickness at each stage will be determined primarily by the bath temperature and its water content, with hardness and pH riding along to complicate matters. The local swelling of the gelatin will depend on the local hardness modulation. By gradually increasing bath temperatures as water content is reduced, the average swelling can be maintained at a nearly constant level until there is essentially no water left by the time the plate is in 100 percent isopropanol. Optimum processing of a dichromated gelatin reflection hologram includes a warm water soak to maximize index modulation and induce overall swelling, followed by a series of baths of varying temperature and alcohol-to-water ratio to adjust overall thickness and to control differential thickness change through the gelatin layer. The response of the emulsion to sensitization, exposure, and development is complicated, but certain observations are particularly helpful toward formulating a workable model of the mechanisms involved. Reflection holograms made in dichromated gelatin do not behave as predicted by classical analysis of thick holograms. In particular, I have found that the spectral selectivity can rather easily be made to be much less than would be expected according to standard theory. Display holograms recorded with identical exposure energy in emulsions of identical original thickness can be made to reconstruct in colors ranging from monochromatic to black and white by varying the exposure geometry and processing conditions. Factors affecting reconstruction bandwidth are listed below. The exposure energy required to make a bright hologram in dichromated gelatin depends on a number of factors. Typically, the amount of dichromate in the gelatin is enough to absorb a sizable fraction of the light passing through. Therefore, there is inevitably an exposure gradient which can have significant effects on the hologram. Furthermore in a reflection setup the exposure gradient of the reference beam is necessarily opposite to that of the object beam, so there is a large variation in beam ratio throughout the thickness of the emulsion. The exposure and beam ratio gradients, to complicate things further, are dependent on the angles of incidence of the object and reference beams. If "sensitivity" is taken to mean the degree of brightness in the hologram versus the exposure energy, then dichromate concentration, emulsion thickness, exposure geometry, and exposure wavelength can influence the sensitivity. The primary factor affecting sensitivity, however, is the initial hardness of the gelatin. The exposure energy required to achieve optimum brightness levels (50 to 75 percent diffraction efficiency) using various common exposure wavelengths are approximately as shown in Table 2. Typical beam ratios used in recording display holograms are in the range of 10:1 to 20:1. However, very high levels of diffraction efficiency can be obtained with beam ratios as high as 100:1. Very different results are obtained when the emulsion side of the plate faces the object or reference beam. This will be discussed later. After exposure, the ammonium dichromate is removed from the gelatin by a water wash or a bath in fixer followed by a water wash. The hardness of the gelatin may be further adjusted at this stage by using a hardening fixer or a separate hardening bath. Temperature, pH, and length of time in the baths can have profound effects on brightness, color, and scatter in the hologram. The plate is immersed in alcohol following removal of the ammonium dichromate in the water bath. The alcohol removes water from the bulk of the gelatin, leaving a strongly modulated index of refraction corresponding to the interference fringes produced during exposure. Several alcohol baths may be used, graduated in water/alcohol ratio and temperature; or the plate may be immersed in alcohol immediately after the water wash. The rate of progression from 100 percent water to 100 percent alcohol can strongly affect brightness, color, and bandwidth; and the temperature progression can affect brightness, color, bandwidth, and scatter. Isopropanol is the best alcohol to use, but ethanol, methanol, and acetone also work. Using ethanol and methanol typically results in dim, very low noise holograms that reconstruct at wavelengths shorter than the exposure wavelength. With isopropanol the reconstruction wavelength and bandwidth can be varied over wide ranges by proper choice of temperatures, concentrations, and rates in the water to alcohol transition. In the model presented here, the gelatin's thickness change and optical index modulation result from a combination of intermolecular rearrangement and molecular deformation under the influence of osmotic forces acting on a felt-like tangle of helical gelatin molecules. The response of the gelatin to the opposed flows of alcohol and water respectively, into and out of the gelatin, is limited by intermolecular and intramolecular linkages induced by hardening agents and photoreduction of the dichromate ion. The overall thickness of the gelatin controls reconstruction wavelength; differential thickness change controls reconstruction bandwidth. Thickness varies in response to changes in temperature and pH of water baths, while the ability of the gelatin to respond to temperature and pH changes is limited by the "stiffness" of the gelatin, determined by the ratio of alcohol to water in the baths. By the time the plate has reached the final alcohol bath, the gelatin is dry. In its wet condition, gelatin is flexible and easily deformed. The fibers slide easily over one another and bend easily. In the dry condition gelatin is rigid and inflexible and will maintain its shape. The regions in the gelatin that have received more exposure are less capable of holding water and will reach the dry condition earlier than the regions of lower exposure. In the transition period when the most highly exposed regions are "dry" and the less exposed regions are "wet", gelatin will be redistributed. Gelatin density near the hardened regions will increase, while the density will decrease in the less hardened regions. The forces involved in rearrangement of the gelatin are very strong. A uniformly hardened gelatin layer can easily bend a stiff glass plate as it dries. A dichromated gelatin hologram processed gradually behaves like a nearly ideal thick hologram because it has been uniformly developed throughout its thickness. It is strongly wavelength selective, and the reconstruction wavelength depends directly on the final emulsion thickness just as it should. If the processing is altered so that the transition from 100 percent water to 100 percent alcohol occurs with no intermediate stages, and if the alcohol is heated so that dehydration occurs very rapidly, the hologram differs dramatically from the ideal thick hologram. Its reconstruction bandwidth becomes extremely large. In this case of fast processing, the gelatin dehydrates at different rates throughout its depth. At the gelatin/alcohol interface, dehydration is accomplished immediately. The alcohol heats the water trapped deeper in the emulsion and drives some of it back toward the glass substrate, further swelling the deeper regions before drying them. Fast processing produces a differential swelling through the gelatin layer so that the regions closest to the substrate reconstruct at long wavelengths while the regions near the outside surface reconstruct at short wavelengths. The index modulation is so high in dichromated gelatin holograms that each relatively thin region can diffract its own particular wavelength with very high efficiency. A simple reflection grating can be developed to act as a highly selective interference filter, or it can be developed to be as achromatic as a silver mirror. There is one particularly interesting regime of processing conditions. When a hologram is processed gradually so that it passes through baths with particular ranges of temperature and water content, there appears an abrupt transition in the reconstruction wavelength. When the temperature transition is slow at first then rises rapidly only at low water to alcohol ratios, the hologram may turn out green, for example. When it is reprocessed with the temperature increasing rapidly in earlier baths, the hologram will turn out yellow. 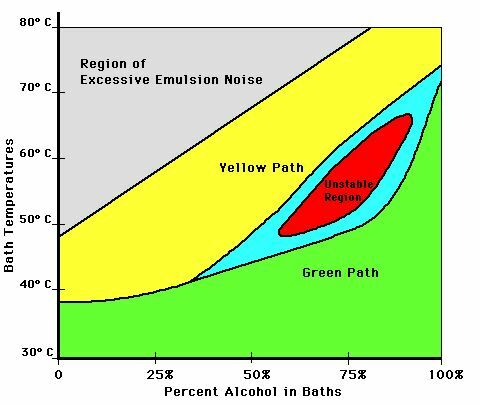 When the temperature and water/alcohol ratio vary along an intermediate path, the hologram tends to come out with random green and yellow blotches, with the size of the yellow blotches rising as the early temperatures rise. This is diagrammed in Figure 3. This behavior suggests that two types of swelling occur simultaneously in the unstable region, perhaps relating to unbending of long helices in the low swelling region and to stretching of the helices in the high swelling region. In the upper left region of Figure 1, the gelatin solubility is high enough that the gelatin is damaged, leading to distortion and scatter. The final average or peak color of the hologram depends on the ratio of pre-exposure thickness to final thickness. The reconstruction bandwidth depends partially on index modulation depth and emulsion thickness, but mostly on differential shrinkage or swelling through the thickness of the gelatin. Recording geometry has a greater effect on reconstruction bandwidth than any other factor when dichromate concentration is high. Depending on whether the reference beam is incident on the gelatin first or the glass first, the exposure gradient in the gelatin is respectively positive or negative going from the gelatin surface to the gelatin/glass interface. The degree of swelling in response to any of the factors is higher in the regions of lower exposure, where the gelatin is softer. Thus, when a hologram is rapidly dehydrated in hot alcohol, its tendency to shrink differentially is enhanced when the reference beam is incident on the gelatin side, and reduced when the reference beam is incident on the glass side. It can be seen that increased concentration of dichromate in the gelatin will increase the exposure gradient and consequently increase the reconstruction bandwidth when the reference beam is incident on the gelatin side. Conversely, increased dichromate concentration will reduce reconstruction bandwidth when the reference beam is incident on the glass side. Increasing the initial gelatin thickness has an effect analogous to increasing the dichromate concentration. The model presented here is based on observations made during several years of working with dichromated gelatin both in an exploratory mode and in a commercial production mode. The exploration was done in much the way a blind man with a cane might explore the topography of a mountain range, following the ridges and the stream beds to get a qualitative idea of the shape of the land without much concern for exact values of latitude, longitude, or altitude. Nonetheless, the model works. Applying its principles has resulted in an unprecedented degree of color control in reflection holograms recorded in dichromated gelatin, and a greatly reduced need for trial and error in adapting to uncontrollable variations in gelatin quality or processing conditions. Certain aspects of the model need to be explored more carefully. In particular, too many properties of the gelatin are lumped into the single term "hardness". Hardness should be broken down into several properties including compressibility, tensile strength, elasticity, and solubility. It could well be that different types of hardeners affect these properties differently. If the properties of gelatin can be manipulated to provide a greater number of stable states within the unstable region in Figure 3, and if those states can be accessed with precision, a lot of interesting possible applications arise. Another aspect in need of further exploration is that of emulsion noise. Scatter seems to be of several distinct types, some of which seem to have nothing at all to do with solubility but can nonetheless be controlled by proper hardening. Using only a Helium-Cadmium laser at 442 nm and applying the principles of this model, it has proven possible to record holograms in dichromated gelatin that reconstruct variously at monochromatic green through ultraviolet, and brick red through stark black and white. The Argon ion laser lines of 514 nm and 488 nm have been used to record holograms reconstructing everywhere from infrared through ultraviolet. It is hoped that this advanced level of color control will be used to extend the range of application of dichromated gelatin holography, particularly in the artistic realm. Much of the work leading to this paper was done by the author while at Holex Corporation in Norristown, Pennsylvania, and the remainder was done at his private laboratory in Santa Clara, California. The author thanks Larry Goldberg and Gerry Goldberg for providing an atmosphere conducive to innovation, and Robert Bloom and Michael Long for their assistance in various experiments and for their helpful discussions.